Svalbard Archipelago is part of the Tentative list of Norway in order to qualify for inclusion in the World Heritage List. Prices and practical info as of August 2015. Completely different from any other places I have visited so far. Gateway to the Arctic area. If you want to start visiting Far North probably it is the best place to start. Some basic hints - maybe will be helpful. Flight - there are 2 lines flying to Longyearbyen - SAS (normal airline so you can take normal luggage with you - there are no free meals on board - and Norwegian, cheap airline - apart from the ticket itself you have to pay for the luggage as well. Accommodation - the cheapest option is a camping site close to the airport (120 NOK if you have your own tent). More expensive are hostels - Coal Miners' Cabins (Nybyen) and Russian House (Russkij Dom) located more convenient in central Longyearbyen. The cheapest option start with 300 NOK per dormitory. In high season it is better to book well in advance. Travel options - one day boat cruises - the cheapest (in fact the most convenient) are those organised by Polar Charter (Polargirl) - two main options are very interesting and covers quite a huge area around Longyearbyen. Pyramiden trip goes to abandon Russian mining settlement going throught 2 National Parks on its way: Nordre Isfjorden National Park and Sassen–Bünsow Land National Park - full day trip. Barentsburg trip goes through Isfjorden (Nordre Isfjorden National Park) to Barentsburg (active Russian mining settlement). Both trips are spectacular (especially with excellent weather) and highly recommended. General warning - Svalbard archipelago is well know for its polar bear population. In fact there are more polar bear than people. All the trips outside Longyearbyen city limits should be equipped with a gun. In fact even the road from the airport is regarded as not fully safe. For anyone wanting to experience the “high Arctic”, Svalbard is the place to go. With the right sort of trip and a bit of luck you will get above 80 degrees north (only a few Russian islands and the furthest parts of Ellesmere Island and Greenland extend that far) and gain excellent views of the mammalian, avian and plant life of the Arctic. In common with most visitors, we went to Svalbard on a ship-based cruise (2004). I personally wouldn’t want to go on a vessel of bigger than 50 passsengers. This permits all to be offloaded on no more than 5 zodiac craft which is more than enough when following wild-life by water or when disgorging people ashore. Economic realities and new environmental regulations for ships in both Svalbard and Antarctic waters (most ships operate in both at the appropriate time of year) are tending to push their size up to those carrying c100 passengers unfortunately – far better than the 500+ boats but too many people in my view for a good experience. July is perhaps the optimum month (and 24 hr sunlight of course!) but voyages which promise a circumnavigation of Spitzbergen and access to the remoter east coast are likely to meet too much sea ice in the Hinlopen passage until late August. We saw 14 polar bears on our 1week trip with excellent and extended views in natural circumstances (photo). We haven’t been to Churchill, Canada which would appear to offer a better “guarantee” of multiple bear sightings with close ups for photography – though we personally prefer seeing them from zodiacs and vessels (we also had some nice sightings of them at sea on ice flows) than from the “Tundra Buggies” used in Churchill. Any views of Polar bears during a shore excursion on Svalbard are likely to result in immediate cancellation of the landing. All such trips are of course on foot, accompanied front and rear by guides carrying rifles – polar bears are dangerous and unpredictable. Any close contact would be met first of all by air shots to scare the creature whilst the killing of an animal results in a major inquiry at which the actions of the guides in creating/allowing the situation are investigated. On occasions, our group of 50 was like a can of worms as it scattered in all directions among the rocks searching for plants and birds – our guides were most concerned about the possibility, however unlikely, of a bear emerging from a hiding place! Another creature you could expect to get fine sights of is Walrus. Landings and close approaches to the major “pull out” site of Moffen Island in the far North are not allowed – though you can get close enough for good views with binoculars. You could hope for close ups of single animals or small groups on beaches at other landings however – we had several at a distance of 30 metres. Beluga and other whales should also be seen – as should Arctic Foxes. The Arctic flowers were magnificent in July and of interest even if flowers aren’t normally “your thing”. Then of course there are the birds – often in vast numbers as well as the less common high Arctic specialisms such as Ivory Gull. The scenery too is magnificent. The name “Spitzbergen” possibly implies a more mountainous island than it actually is – Svalbard’s highest point is only 1717mtr. But you should get “up close” to glaciers both by on foot and by vessel. Though an accident in 2007 when a calving glacier showered a ship with ice and waves injuring several passengers probably means that ships now don’t get quite so close!! If you go on a trip to the north coast you should also get some experience of the ship pushing its way through ice flows in classical Arctic/Antarctic fashion! It appears that Norway intends nominating Svalbard on “mixed” criteria to include some of its sites of Arctic history and even a 1 week visit is likely to enable you to see a number of these. Whilst the magnificent natural sights of Svalbard will be the highlight, these “cultural” visits will add to the overall experience of any trip. It seems unlikely that Barentsburg with its operational mines, Lenin busts and Soviet atmosphere would be included – but it IS interesting and worth seeing! There are other mining and whaling station remains which seem likely to be within any inscribed boundary. Elsewhere there are a WWII German secret weather station Haudegen whose crew were the last German soldiers to surrender when discovered in Sept 1945 (4 months after the end of the war!) and locations where airships set off for the North Pole on both successful and unsuccessful expeditions. A potential complexity with gaining inscription might lie with the Svalbard Treaty of 1920. This granted Norway “full” sovereignty to these previously unassigned islands but subject to certain restrictions particularly concerning economic exploitation. Originally involving 9 signatories, there are now around 40 (Including such well known “Arctic nations” as Saudi Arabia, Australia and Afghanistan!!) – all of whom maintain the right to engage in “commercial activities” in the archipelago. The continuing presence of Russia’s unprofitable coal mines at Barentsburg is a result of this treaty. The Treaty commits Norway to “respect and conserve the Svalbard environment” but it is not totally in control of the use of that environment either on land or in the surrounding seas (which are obviously important for the continuing health of the land-based environment). For instance, there has been a long running Russo-Norwegian dispute about fishing and other rights beyond the 4 mile territorial limit. As part of this, Norway has claimed the continental shelf around Svalbard on which matter the treaty is unclear – negotiations continue! A report in the Barents Observer of 2009 stated “An application for nomination will be ready earliest at the end of 2012, and will be considered by UNESCO’s World Heritage Committee in 2014”. 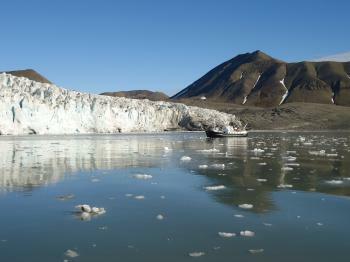 And “It is not yet known which part or how much of Svalbard will be on the World Heritage List. This will be decided during the nomination process. 65 percent of the land area and 87 percent of the territorial waters within the 12 nautical mile boundary is today protected by the Svalbard Environmental Law, aimed to preserve the archipelago’s unique nature and culture.” So, it looks as if Norway expects to progress this T List site in the relatively near future. No really “High Arctic” site has currently been inscribed – though Canada has a large area of northern Ellesmere Island on its T List (Quttinirpaaq NP at 82 degrees north – approx 2 degrees north of Svalbard). Of those inside the Arctic circle at 66 degrees 33 (Wrangel, Putorana, Ilullisat, Alta, Struve and Laponia) only Wrangel even reaches 71 degrees north. Norway’s record in successfully nominating sites for inscription has not been unblemished but this would appear to be a “shoo-in” site if properly prepared and presented.